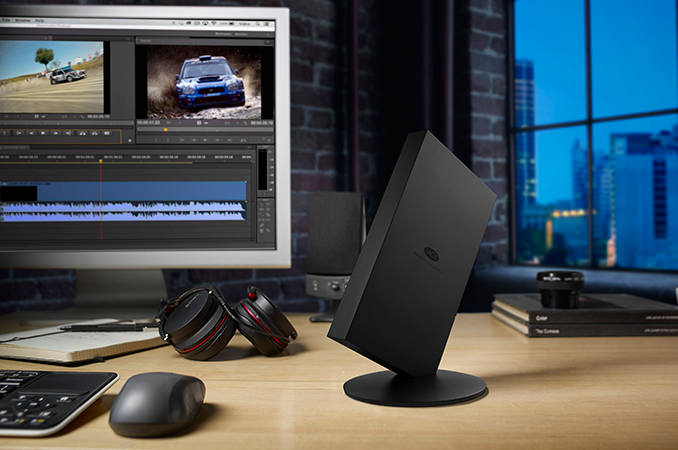 LaCie this week has introduced its first external solid-state storage solution using Thunderbolt. The Bolt3 uses two M.2 SSDs in RAID 0 mode to enable 2 TB of storage as well as up to 2800 MB/s data rate, which is the highest level of performance offered by an available commercial DAS device. The Bolt3 is being advertised for video professionals who edit 4K (and up) video. The LaCie Bolt3 (STFF2000400) packs in two 1 TB NVMe SSDs in M.2 form-factor that work in RAID 0 mode to enable up to 2800 MB/s read and up to 2200 MB/s write speeds. Seagate, the owner of the LaCie brand, does not disclose which SSDs the device has under the hood, but the company states that the Bolt3 was designed with long-term reliability in mind. This might imply that the device uses drives with high endurance (although, we cannot say whether the maker uses datacenter-grade SSDs). The external storage solution can realize its whole potential when connected to a TB3-enabled computer using the active Thunderbolt 3 cable that is bundled with the device. The Bolt3 also has another TB3 receptacle so to daisy chain more Thunderbolt 3 devices (storage or display) or even charge them (the Bolt3 has its own external PSU). From an aesthetic point of view, the LaCie Bolt3 is designed to be seen on a desk. It is made of black aluminum, it features a blue LED on the backside and the enclosure is tilted by 45° to its stand. The mounting mechanism uses neodymium magnets that firmly attach the Bolt3 to its stand, but allow to quickly detach it and transport anywhere. Users can have the drive flat as well. To ensure long-term reliability of SSDs inside, the Bolt3 also has active cooling. The LaCie Bolt3 belongs to the company’s limited edition series which are designed to promote performance as well as eye-catching design. This means it doesn't come cheap. The LaCie Bolt3 2 TB will be available this quarter for $1999, which is well beyond the price of consumer SSD storage and more than one would have to pay for a DIY 2 TB Thunderbolt 3 external storage solution. As the LaCie Bolt3 is the fastest off-the-shelf external storage solution available today, the manufacturer wants to charge a premium. "Seagate, the owner of the LaCie brand, does not disclose which SSDs and/or RAID controller the device has under the hood"
Your prayers have been answered. You can get the Samsung T3 USB3 SSD in 2TB form for around $700, and get roughly 3-500MB/s of throughput, which is all any reasonable person could even use today. If you want ridiculous numbers-for-sake-of-numbers performance, then you gotta pay the big bucks... that's the way it has, is, and always shall be. "Seagate states that the Bolt3 was designed with long-term reliability in mind. This might imply that the device uses drives with high endurance"